On my first day in Korea it came as no surprise to me that the county is facing the same environmental, social and political problems as most of the rest of the world and like much of the world the average citizen is comfortable enough to remain asleep to the issues. I was able to get a glimpse into these issues from the woman who was working the front desk at my guesthouse in Seoul. It turned out she was studying environmental science at University and was familiar with Portland because of our “green” and “sustainably” initiatives (she actually used the ironic air quotations to indicate her understanding that these are loaded terms). As I was getting ready for my day and asking her what I should do, she pointed out the normal tourist things and then said, “but if you are interested in environmental stuff, you should really go check out Seoul’s “stream””. She went on to tell me how in Feng Shui it’s important that palaces be built with the mountains behind them and a river in front. The main palace in Seoul was built with this in mind hundreds of years ago, but due to development and over use of water, the river that had once flowed in front had since dried up. She said that in a grand political move to garner public support and help his construction buddies, the then Mayor of Seoul (and now president of Korea) decided to bring the river back to life. Unfortunately, as is often the case, this was not a project to restore an ecosystem and little environmental considerations were taken into account. This rivers new life was more like life-support rather than being healed. The river bed was paved over and water was pumped in from a nearby river in order for it to flow. Wildlife and fish were introduced, but nothing survived for long as it was not an appropriate habitat. She told me that people in this city are so desperate for any “green space” that there was mass acceptance for the project and now across the country there are similar plans to implement these artificial rivers. She said that most people in Korea are ignorant to the issues and don’t understand what’s going on. Which is a sentiment I understand from working on similar problems back home. While listening to her lament about corrupt politicians, feel-good environmental projects and a citizenry that is more wrapped up in consumerism than dealing with real issues, it reminded me how connected we really are and how until we develop radical new social and political systems, our struggles will be mostly uphill battles. The hydrological cycle is just one ecological system necessary to sustain life and a fake river does nothing to restore this system, but does a good job at making people forget that there was a problem in the first place. Unfortunately, the planets ability to sustain life includes humanity and if we forget this we have no one blame but ourselves and it will be our future generations that will ultimately pay the price. This entry was posted in Photography, Travel and tagged environment, Korea, photography, travel on April 5, 2012 by Lauriel~Arwen. I love that she used air quotes. We’re so much more alike than we’re told. While the restoration was more about creating a public place while removing a freeway, it could hardly be considered a project that was to restore the stream to something ecologically thriving. 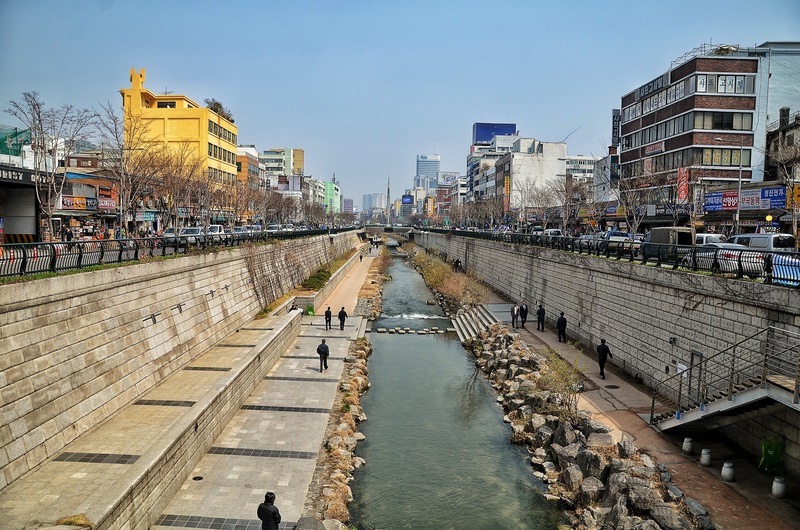 But compare this to the urban water ways of San Antonio or Las Vegas and Cheonggyecheon is far and away a better project. While it may be costly, and it may have flaws, we need to start replacing urban highways with public transit and public space.